Education CS Fred Matiang’i addresses teachers during the 42nd Annual Teachers Conference at Wild Waters in Mombasa on June 20, 2017. The Teachers’ Service Commission will in January recruit 2,205 teachers to replace those who have left even as controversy rages over the transfer of estimated 180 principals to stations away from their home counties. Those to be replaced include teachers who retired, died or resigned between September and November 2017. A circular by TSC chief executive Nancy Macharia to the secretaries and boards of management of the affected schools says 1,681 teachers will be hired in primary and 524 in secondary schools, respectively. The schools are spread around the country. “All interested candidates should submit their applications to the respective County directors and Boards of management not later than Friday, January 5, 2018,” the circular reads. Yesterday, Macharia maintained that the commission would not reverse the transfers that have triggered a vicious war with teachers’ unions. “It is the policy that we will not be allowing head teachers and principals to serve in their home counties or be in one school for more than nine years,” Macharia told the Star. The Kenya National Union of Teachers Sunday protested the transfers, terming them ‘political’ and aimed at advancing vested interests. Secretary general Wilson Sossion threatened to call a nationwide strike by teachers from January if the transfers are not halted. He accused the TSC of disregarding the safety of teachers deployed to ‘hostile’ and ‘insecurity prone’ regions such as parts of northern Kenya and Rift Valley. “We have seen attackers target non-locals, but it is unlikely that local teachers would be targeted,” he said. In November 2014, 17 teachers were executed in Mandera when al Shabaab militants hijacked a Nairobi-bound bus. This forced non-local teachers to boycott work for months, demanding transfers. But the Kenya Union of Post-Primary Education Teachers (KUPPET), which last week voiced its dissent, was measured in its reaction yesterday. It commended the TSC move as designed to improve service delivery but one that needed further consultation to ensure smooth implementation. KUPPET Secretary General Akello Misori said the unions had an agreement with the TSC to deploy teachers who are spouses around the same area and home when HIV/Aids was declared a national disaster to reduce its spread among the profession. “We need more discussions because there are other factors that if not considered in execution might end up being disastrous,” Misori said yesterday. The Star is in possession of the list of 181 principals transferred from various schools across the country. It transfers heads of 31 national schools, 77 extra county boys’ and 73 girls’ schools. The union insists the figure is over 500. 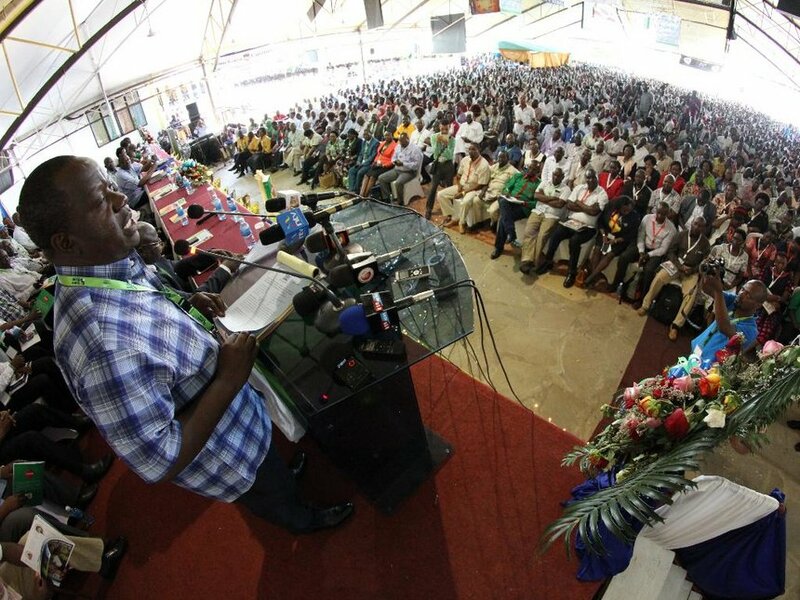 The TSC last recruited 1,730 teachers in August to replace those who had left. In the new exercise recruitment slated for next month, in the post-primary group, the Central region will get 91, Coast 30, Eastern 80, Nairobi 28, Northeastern 18, Nyanza 77, Rift Valley 128 and Western 70 slots. Only two slots will be reserved for tertiary institutions. The recruitment will increase the workforce to 315,935, which will still be 87,489 short of the required ratio. Of the deficit, 39,913 are in primary while secondary schools have a shortage of 47,576 teachers. According to the Education ministry statistics, only six of the 47 counties are teacher-sufficient in primary schools, while all secondary schools have shortfalls. However, the unions argue that the country needs 100,000 teachers to meet the global standard of teacher-student ratio. Even though they will be interviewed at the county level, the TSC makes it clear in its circular that successful applicants must be prepared to work outside their counties — the new policy of deployment that has generated heat with the unions and a section of politicians. “Successful candidates are not limited to their home counties in deployment,” the TSC says. Yesterday, TSC spokesperson Kihumba Kamotho told the Star that it was within the TSC mandate to implement the policy that requires teachers to work outside their native counties. “The policy has been there, but this is the first time we are institutionalizing it and we have started with the headship and recruits,” he said. “It is good for teachers as it disassociates management from local politics,” he explained. Kamotho said the policy draws its legal mandate from the Teachers’ Code of Conduct, which was developed in 2015 in consultation with teachers’ unions. “This was a negotiated agreement with stakeholders,” he said. Speaking at the release of the KCPE results last week, TSC CEO Nancy Macharia spelt out measures that would be adopted by the commission in professionalizing management of institutions. They include transfer of heads and their deputies from their home counties, and limiting stay in an institution to a maximum of nine and six years, respectively. Although the policies were first developed by the TSC in 2007, their implementation was scuttled by resistance from teachers’ unions. The TSC argues that local teachers are prone to complacency, conflict of interest and negative influence in the management of schools. “We are looking at having 100 per cent success of the policy especially starting with primary schools,” Kamotho told the Star. “We will then gradually extend to secondary schools, where we have challenges because of specialization of subjects,” he added. The TSC argues that the new policy of de-localization will enhance cohesion. While launching the policy in February 2007, then TSC secretary Gabriel Longoibon said de-localization would help curb complacency among heads who overstay in schools.